This article is 2658 days old. Windsor Police have released this surveillance photo of the suspect wanted in relation to the robbery of meat at the Metro Grocery Store located at 2750 Tecumseh Road West on Monday January 9th 2012. The suspect grabbed four steaks from the meat counter and then place them inside his winter coat, and then t walked directly to the front of the store and passed the checkout counter without making any attempt to pay for the meat. The manager followed the suspect and as they reached the exit doors to the store, the manager confronted the suspect demanding to see a receipt for the merchandise still concealed in the suspect’s coat. At this point, the suspect punched the manager in the face causing him to fall to the ground. The suspect fled on foot to the parking lot and was followed by a witness who observed the assault. The store manager did not require medical treatment as a result of the assault. The suspect was seen getting into a grey four door vehicle. The witness was able to obtain Ontario licence plate # BBBR 166 as the vehicle sped away through the parking lot toward Tecumseh Road. 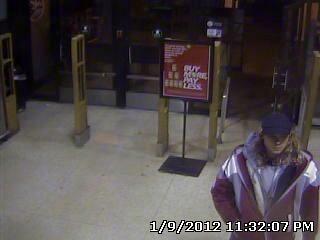 The suspect is described as a white male, early 20′s, 6′ tall, medium build, with long curly red hair. He was wearing a grey winter jacket and jeans. Anyone with any information regarding this robbery or the identity of the suspect is asked to call Windsor Police Investigations at 519-255-6700 ext 4830 or anonymously to Crime Stoppers at 519-258-TIPS (8477).